The first version of ASP.NET 1.0 came out almost 14 years ago. Since then many developers have used it to build and run great web applications, and over the years we have added and evolved many, many capabilities to it. Today we are excited to announce the release of ASP.NET Core 1.0! This new release is one of the most significant architectural updates we’ve done to ASP.NET. As part of this release we are making ASP.NET leaner, more modular, cross-platform, and cloud optimized. ASP.NET Core is now available, and you can start using it today by downloading it here. We challenged everything instead of delivering an incremental update so you can have an extremely modular, fast and lightweight platform perfect for the new era of software development where monolithic applications are replaced by small, autonomous services that can be deployed individually. All of that while keeping and extending what .NET is best for: developer productivity, and modern languages and libraries. The end result is an ASP.NET that you’ll feel very familiar with, and which is also now even more tuned for modern web development. This is a 1.0 product which means it is just the beginning and does not have all the functionality of ASP.NET 4.x stack. For example, features like SignalR and Web Pages will come later in the year and other features like Web Forms which are deeply tied to System.Web will remain in the .NET 4.x framework. 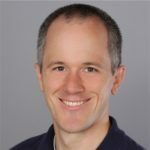 If you are an existing ASP.NET 4.x developer do not feel rushed to move to ASP.NET Core, we still plan to update Web Forms, MVC, Web Pages, SignalR on .NET 4.x as well. If you are not a .NET developer, now it’s a great moment to try it. You can enjoy the productivity and power of .NET with no constraints, on any OS, with any tool and for any application. All of that fully open source, developed with the community and with Microsoft’s support. There are several places you can go to get a copy of ASP.NET and get started. You can start with the https://dot.net/core website to download the latest version of .NET framework and tools for your operating system. If you’re using Visual Studio 2015, you can install the new Visual Studio SDK and get started right away. If not, choose one of the downloads for the .NET Core SDK on Windows, Mac or Linux. Then, download the web development tools for your preferred editor and you can start building web applications with ease. 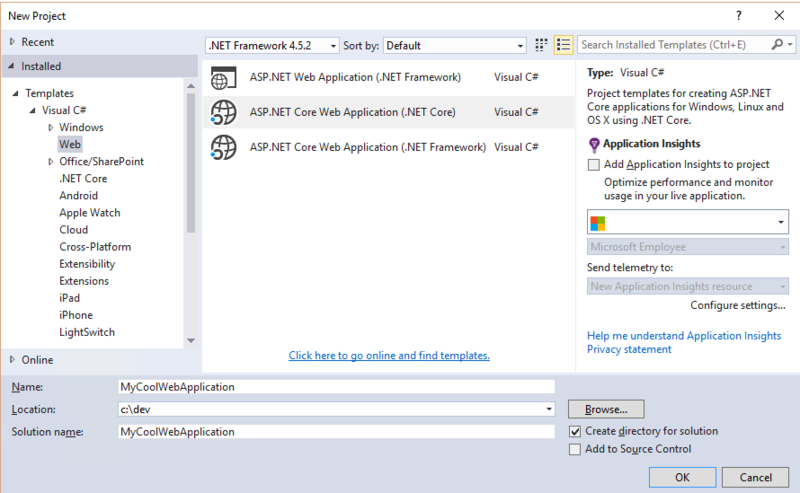 NET Core Web Application (.NET Framework) – This starts a new project that runs on the standard .NET Framework on Windows. The starter template is responsive, with a simple carousel at the top and some details at the bottom of the initial home page to give you some tips and information about how you can further develop your new ASP.NET Core Web Application. In the case of web applications, you will have to open the browser and navigate to the URL reported by the dotnet tool. As this command-line tool evolves, we will add more templates and language support. There are a number of file-templates that come with the yeoman ASP.NET Core templates. These can be used to generate controllers, views, and other ASP.NET files that you may want to create. You can find a complete list of those templates with their usage documented on the Yeoman ASP.NET Generator repository. ASP.NET Core is a reinvention of the ASP.NET web frameworks. From the beginning of ASP.NET in 2002 the .NET server-side frameworks have been built around the concepts of modules, handlers, and integration with Internet Information Server (IIS) on Windows. With ASP.NET Core, we have rewritten the web framework and .NET framework to better enable a modern web development experience and provide a baseline to build the next 15 years of server development. By removing modules and handlers, which are IIS concepts, we can make ASP.NET Core run great on other web servers like Nginx and even in your own hosted application. All application development for ASP.NET Core is built around a new middleware definition and a Controller-centric approach. ASP.NET Core was built with other operating systems besides Windows in mind. If you want to share code with teammates that prefer to work on Mac OS X or Linux, ASP.NET Core will allow you to collaborate with those developers and deliver the same experience with our web frameworks when targeting.NET Core. If you and your team prefer to use Windows for all of your development, you can choose to do that as well. ASP.NET Core enables you to work with your development team where they prefer working, and that makes everyone happy. Visual Studio 2015 on Windows is the premier tool for creating, managing, and debugging your ASP.NET Core applications, but you can get started on any platform with Visual Studio Code. Visual Studio Code is a lightweight text editor with plugins that support editing ASP.NET Core applications. Additionally, it comes with plugins to manage your interactions with a Git source control provider and to Debug your ASP.NET Core applications on any operating system. What about Containers? ASP.NET Core now supports running in containers, with options available on hub.docker.com for Linux and Windows based containers to host your applications. ASP.NET Core was born on the web and will be built on the web, with all source code available in our GitHub repositories. You can navigate to the source code by starting at the https://github.com/aspnet/home repository. You are welcome to download any and all source code and tinker with it, make any change you would like. If you build something that works, you can submit a pull-request and we will review your changes and consider merging it. Your code will go through the same tests and reviews that Microsoft engineer’s code will go through. We decided to make all of .NET full open source because we understand that the .NET Community is a large vibrant group of technologists that has a stake in the direction of .NET. In 2016, all of the modern web stacks are open source and we wanted .NET on equal footing with those other tools on the market. The documentation is open source as well. You can find the documentation for ASP.NET Core at https://docs.asp.net and each article has an “Edit this page” link on the top. If you can improve an article, click that edit button and submit your changes. Our documentation team will review your changes and may merge them into the document. There’s a brand new documentation site for all of .NET accessible at docs.microsoft.com/dotnet where you can learn about all of .NET Core and ASP.NET Core. All of that content is open source as well. More information about the support policy along with a placeholder for when each version, including the 1.0 release candidates, will go out of support are listed on the .NET Core Support Factsheet. In previous versions of the ASP.NET tools, you would have to reference libraries from the base class library in the GAC. This would result in many libraries getting loaded into memory, like System.Windows.Forms, that weren’t really needed for your web application to generate HTML to deliver to a web visitor. The new model will include only the framework references you need, and those references will be added as NuGet packages. By using a NuGet package approach to managing dependencies in your project, we can deliver updates and patches to the framework through our NuGet package manager as updates and patches are ready. Additionally, the framework can be deployed with your application in the same destination folder. In this way, your application will not be affected by an update to the host operating system because it will continue to reference its local copy of the .NET framework libraries that it needs. The first two tests use middleware to process and handle the TechEmpower test scenarios directly, while the last two tests use MVC to respond to the test scenarios. These results have been submitted to TechEmpower and will be part of their 13th round of web performance tests. From these numbers, the Kestrel server can handle more than 5 million requests per second, and that’s good enough for a top 10 finish among the available servers. This is our first published benchmark for these tests, and we’re going to continue improving these numbers. If you’re interested in learning more about how we calculate these numbers or run the tests, we’ve published our source code in the ASPNet/Benchmarks repository. ASP.NET Core comes with Dependency Injection enabled. You’re not required to use it, but we have heard from many developers that they would prefer to have their code activated with dependency injection capabilities enabled. For those not familiar with Dependency Injection, it is a design pattern that allows the dependencies of one class to be injected as objects are required in your application. A common technique is to inject dependencies into a class through a constructor, and when a framework like ASP.NET Core is managing the construction of your controllers and other objects you typically cannot manage this process. With ASP.NET Core, we are delivering a Dependency Injection container that you can use to define the dependencies that should be injected into your controllers, views, or any other class that the framework will create for you. You can get started configuring the container with the ConfigureServices method in the Startup.cs file. The Config object will be populated by an IConfigurationRoot type object, as defined and inserted in my ConfigureServices method. I can then read values from the configuration by using a text-based indexer, in this case to grab the ASPNETCORE_ENVIRONMENT value. If you’d like a container with more advanced features than our default container, there are other dependency injection containers available on NuGet that you can add to your project. More information about dependency injection in ASP.NET Core is available in the docs. In ASP.NET, we started with a single framework the delivered Web Forms with the familiar .aspx extension. As the web changed and programming models evolved we added four other frameworks into ASP.NET. Starting with ASP.NET Core, we are consolidating these frameworks into a single framework that is lighter and initially has the features of MVC and WebAPI. With this merged functionality of MVC and Web API, things are much simpler when you need to introduce cross-cutting concerns with your controller. No longer do you have to consider different routing, security, or filters for an ApiController compared to an MVC Controller. All Controller classes now handle requests using a Web API or MVC approach. Consider the following Controller code:This controller is capable of servicing a Web API GET request, responding on the api/Product route as well as handle a request for the Index page and return with the content of a Razor-based view. This flexibility allows ASP.NET Core developers to centralize their interactions with their web visitors and reuse logic more easily than they could in prior versions of ASP.NET. With ASP.NET Core, we are also introducing a new way to generate client-side code from .NET and make it easier to re-use in Razor markup. We call these Tag Helpers and they are referenced in your server-side markup as though they were another HTML tag that you were using. The Razor engine will recognize the tag and execute the relevant .NET Code that corresponds to it. In the default project template, you can see the environment tag helper in use inside the /Views/Shared/_Layout.cshtml file. In Visual Studio 2015, the Razor editor will highlight the use of tag helpers by marking their code in bold purple text. Learn more about Tag Helpers in the ASP.NET Docs or you can catch the Channel 9 video discussing the feature. ASP.NET Core no longer requires an IDE to compile and run your application. You can now build your application with the dotnet command line interface. Visual Studio 2015 and Visual Studio Code provide a nice graphical interface on top of the standard command-line tools. This way, you can use your favorite editor to write .NET code and get the same compilation results as your friends who prefer Visual Studio. You will also have the same compilation experience on your continuous integration services that you have on your development workstation. More information about the new .NET Core and .NET Command Line interface released today is covered on the .NET Blog. By using the dependency injection container, I can ask for an IDistributedCache object in the constructor of my controllers and work with the contents of the cache based on the value passed in to that constructor. We have also made significant advances in configuration management of our web applications. In other frameworks, you might store your database connection information, cloud storage API keys, or other secrets directly in your configuration files. A quick search of GitHub has revealed too many of these keys in the past, and we want to enable you to hide these values while providing a good experience for operations teams that manage the deployment of these secrets to a production environment. With ASP.NET Core, we’re introducing the SecretManager command-line tool to help you store these values where they won’t be accidentally picked up by your source control tool. More information about the secret manager can be found in the ASP.NET Core docs. To help with the management of the application on the production space, we’ve introduced an easier way to load configuration through environment variables. In the previous sample code, you saw a call to env.IsDevelopment() This is a check that the current environment is named “Development”. By default, when you debug an application from Visual Studio 2015, an environment variable called “ASPNETCORE_ENVIRONMENT” is set to the value “Development” and ASP.NET Core can interpret that value and make features available to the Development environment only. If that environment variable is NOT set, ASP.NET Core assumes that you are running in Production. In the same Startup class’s constructor method, there is a default call to builder.AddEnvironmentVariables() This applies any configuration values that are stored in environment variables to your application. You can configure your cloud services or dockerfile to set environment variables appropriate for your application and they will override any prior configuration value provided. Azure App Service is ready to support ASP.NET Core 1.0 apps. More information for running ASP.NET Core apps on Azure App Service is available at https://blogs.msdn.microsoft.com/appserviceteam/2016/06/27/azure-app-service-and-asp-net-core. If you don’t have an Azure account you can still try an ASP.NET Core 1.0 sample on Azure App Service free of charge and commitment with the trial offer at https://tryappservice.azure.com/?appservice=web. We’re updating our approach for bundling and minification of static web files to use a Visual Studio extension called ‘Bundler and Minifier’ This extension replaces the previous methods of writing ScriptBundle and StyleBundles or using another tool to operate on your files. With Bundler & Minifier you can right click on the files to concatenate or compress and Visual Studio will act on them appropriately. The extension will record your actions in a bundleconfig.json file so that your project changes can be synchronized with source control. You can learn more about the Bundler & Minifier extension on its GitHub repository and from Mads Kristensen on the ASP.NET Community Standup. The EmbeddedFileProvider behavior has changed to set the baseNameSpace to the assembly name instead of an empty string. RuntimeEnvironment has been replaced with RuntimeInformation. A detailed list of changes is available in the ASP.NET Announcements Issue List. The ASP.NET Core team is moving forward with bringing more web capabilities into the Core framework that we have heard our customers want. Look for us to start working on a new version of our SignalR real-time web application capabilities that you may have used in prior versions of ASP.NET. We’re also researching how to bring the ‘Web Sites’ project model from ASP.NET into the Core framework by supporting something we’re calling ‘Controllerless Views’. To keep up to date on the discussion and direction of ASP.NET Core, make sure you tune in to our team leads weekly video broadcast at live.asp.net If you can’t make the live show each Tuesday, then the recordings are made available on the website. The team reads your comments and will respond. We’re excited about the new release of ASP.NET Core, and we think you will be too. A lot has changed from ASP.NET 4.6 and we think this new product is ready to start taking production workloads. If you have a new web application to build, try ASP.NET Core. If you want to build a new application that will be deployed to a Docker Container, try ASP.NET Core. Perhaps you want to build a micro-service that will be interacting with an existing application, we think you should try ASP.NET Core. If you have a 10-year old application that your company relies on, we don’t recommend attempting to port it to ASP.NET Core. We’ve found that the process to move an application from ASP.NET MVC to ASP.NET Core is as significant as the transition from ASP.NET Web Forms to ASP.NET MVC. We recommend that you look at the switch of an application to ASP.NET Core as a rewrite instead of a migration. We’ve made some large changes to the ASP.NET Core product for this release. If you are using ASP.NET 4.6, you can still use those frameworks and libraries. They are a hardened toolset that we will continue to support and update, with patches planned for the upcoming “VS15” product. If you’re building a new application or you need to build an application that runs cross-platform, perhaps in a container, download ASP.NET Core and give it a try. With our fully open, fully cross-platform .NET framework and libraries there is no reason not to use ASP.NET Core and .NET Core. The tools will make your job and the performance will make your customers happier.